Do you not fear The Reaper? This terrifying life size 6-foot (180cm) tall classic horror character features a soft-PVC death head skull with creepy yellow LED light-up eyes, easy-to-assemble metal frame, slush-PVC skeletal hands, and plastic reaper scythe. He wears a black and gray fabric hooded costume with shredded-gauze details. Be careful—the 6 ft. Life Size Standing Animated Lurching Reaper has his eye on you. Designed to lunge toward anyone in his path, this realistic lifelike figure features light-up LED eyes and a moving mouth with sound, perfect for greeting party guests and trick-or-treaters. Complete with his classic scythe and flowing black garb, the reaper is a must-have addition to your Halloween decor. Plug the UL power adapter into any standard outlet and choose from Steady-On, Infra-Red Sensor or Step-Here Pad (included) activation options to operate. 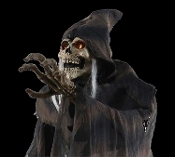 Once activated, the scary Lunging Reaper's eyes will light up with another-worldly glow, as he lunges towards you while saying one of four sayings. The infra-red sensor works up to 6.5-feet away and works in all lighting conditions - bright light to no light! Easy-to-assemble quick-connect poles, assembly required. Approximately Six feet tall (72-inch). Recommended for indoor or covered porch use only. ***Please Note: Products are designed and rated for use in the United States using 120 volt current.